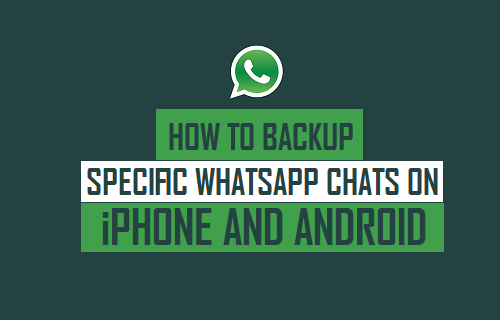 You will find this tutorial useful, in case you are looking for a way to Backup Specific Chats in WhatsApp, instead of using the regular backup feature in WhatsApp which backs up all the Chats in your WhatsApp account. 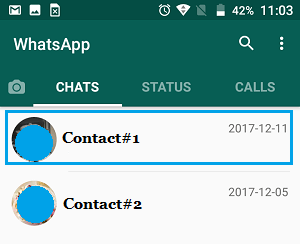 Since WhatsApp is such a popular messaging system, it is quite normal for most WhatsApp users to have at least 10 to 15 Contacts, in addition to some WhatsApp Group Contacts with multiple members. All this results in a ton of WhatsApp Messages, Photos and Videos taking up storage space on your phone or tablet. 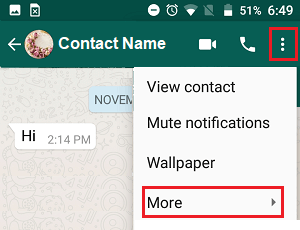 This in-turn results in your WhatsApp Backups getting larger in size. One solution to this problem is to backup only certain or Specific WhatsApp Chats that are important to you and clear out other Chats. Another reason for making a backup of Specific WhatsApp Chats would be to save certain Chats as a record of conversation. 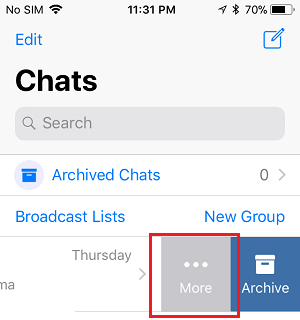 Follow the steps below to Backup Specific Chats in WhatsApp On iPhone or iPad. 3. 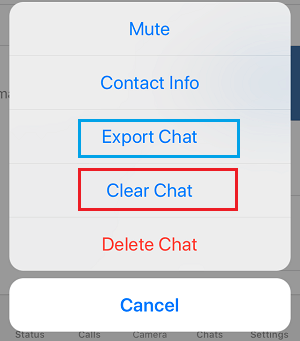 Next, slide the Chat that you want to backup to the right. This will reveal, More and Archive options. Tap on the More Option (See image below). 4. From the slide-up menu that appears, tap on Export Chat option (See image below). 5. 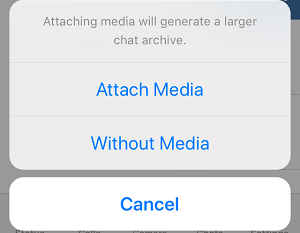 On the next slide-up menu, choose whether you want to Attach Media or backup the Chat Without Media. 6. 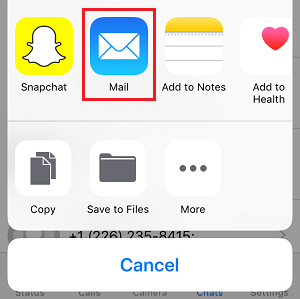 On the sharing menu that appears, tap on the Mail App or any other App that you would like to use to Export WhatsApp Chat. In this case we will be choosing the Messages App. 7. 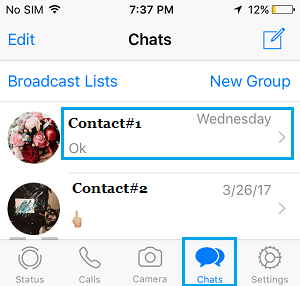 On the Next screen (New Message screen), provide your own Email in the “To” Field and tap on the Send button to send the Chat to yourself. 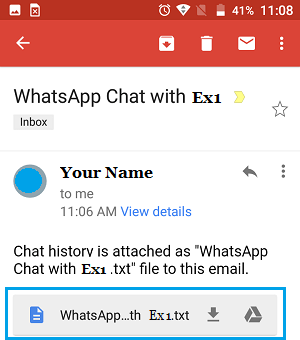 This selected WhatsApp Chat along with all its attached images and video will be sent to your Email Address, from where you can download the Chat to your computer as a backup. 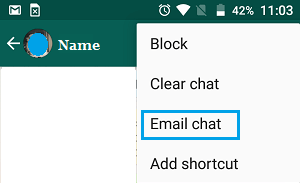 Follow the steps below to Backup Specific Chats in WhatsApp On Android Phone or Tablet. 3. On the Contacts screen, tap on the 3-dots menu icon located at the top right corner of your screen and tap on the More option in the drop-down menu. 5. 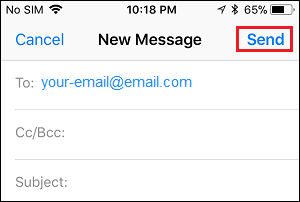 On the next screen, provide your own Name or Email in the “To” filed and then tap on the send button. 6. Your recipient will receive an email with WhatsApp Chat attached as a Text File to the Email (See image below). 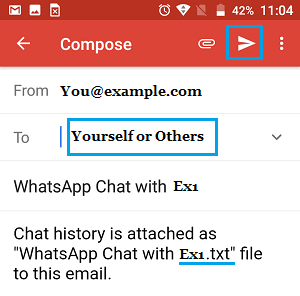 The recipient will be able to view and save the WhatsApp Chat Text File to the computer by clicking on it.